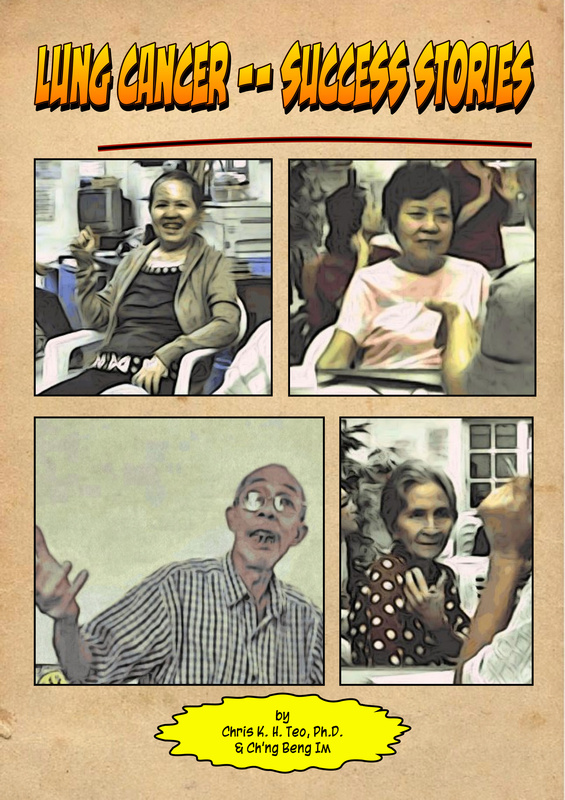 In September 2013, Liz – a 54-year-old Indonesian – has pains around her right rib-cage. An USG indicated fluid in her lungs. Liz was referred to a lung specialist who thought she had tuberculosis (TB). Liz was prescribed TB medication for three months. After three months, there was again fluid in her lungs. About 1.3 litres of fluid was tapped out. Liz was told to continue taking her TB medication. Liz went to Jakarta and consulted another doctor. Pleural tapping was again done and 0.6 litre of fluid was removed from her lung. Liz was again asked to continue with her TB medication. Not satisfied Liz went to Singapore. Blood test, CT and PET scan were performed (note: no CT or PET scan were ordered by doctors in Indonesia). A large right -side pleural effusion is seen involving the upper lobe of the right lung and extending to involve the middle lobe. Suspicious of a nodular mass more than 2 cm in size present in the upper lobe of the right lung. Presence of a small nodule in the left lung in the lower lobe, 6 mm in size. This is suspicious of a possible metastatic lesion. pleural fluid negative for maligancy. pleural fluid is haemorrhagic with few inflammatory cells and an occasional mesothelial cell. Hypermetabolic mass in the upper lobe of the right lung is consistent with pulmonary malignancy. Mildly hypermetabolic paratracheal and precarinal nodes are suspicious of nodal metastasis. 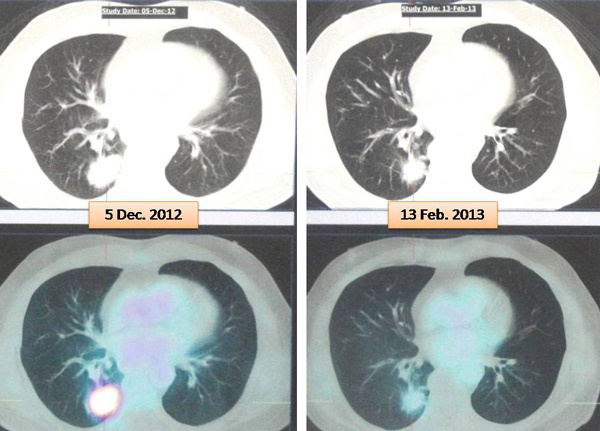 Multiple nodules scattered in both lungs are suspicious of pulmonary metastasis. Hypermetabolic lytic lesions in the thoracic vertebra and left ischium are compatible with metastases. Malignant cells present consistent with infiltrative moderately differentiated pulmonary adenocarcinoma. No MRI imaging evidence of intracranial metastatic disease is detected. Liz was not able to walk by herself and had to use the wheel chair. She received 10 sessions of radiation treatment. After radiotherapy, she was able to walk. But she still had cramps and numbness in her legs. Liz told us that this leg numbness and cramp developed after 2 months on the TB medication. 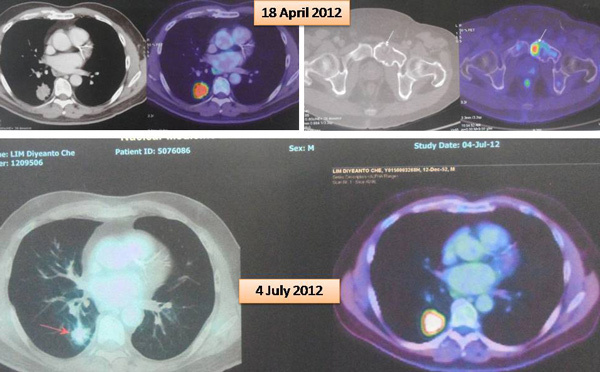 For her lung cancer, the oncologist prescribed Iressa, costing SGD 3,500 per month. 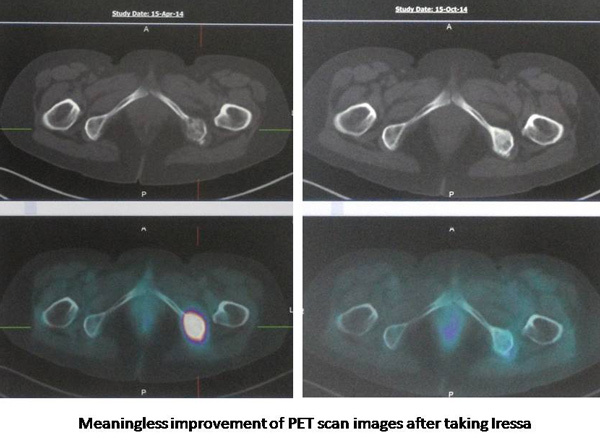 Meaningless improvements of PET scan images after taking Iressa (Study of April 2014 versus October 2014). Stop taking Iressa and go for chemothrapy. Or continue taking Iressa for another 2 months and see what happen. Liz decided to stop further medical treatment and came to seek our help. This is an e-mail I received from Alex. Selamat malam Dr Chris: Saya Alex dari Jakarta. Saya mau minta tolong Dr Chris untuk mengobati papa saya yang kena kanker paru dan setelah kemo dan operasi, kanker tersebut malah tumbuh di liver dan limpa. Saya rencana besok hari minggu, 20 April 2014 berangkat dari Jakarta ke Penang untuk konsultasi dengan Dr Chris … Saya mohon Dr Chris mengobati papa saya. Terima kasih banyak Dr Chris. Salam. The next day, Alex came to our centre in Penang and related the tragic story of his father’s cancer treatment in Singapore. Before that, I asked him, “Who asked you to come here?” Apparently after 2 years of treatment and spending about 2 billion rupiah (RM 600,000?) Alex’s father ended up with more cancer and suffered badly form the side effects of the treatment. Desperate and lost,someone in Sydney told Alex about a Chris Teo in Penang. He immediately googled “Cris Teo Penang” and found CA Care. He then bought a plane ticket and flew here the next day! Indeed it is dramatic but this showed us his concern for his father’s health. Alex came with almost a bagful (his luggage) of medical reports and PET scans. This is his story (all in italic). I come for my father, he is 62 years old. Yes, I bring all the medical reports and PET scans. The problem started in March 2012. He went for a routine check up for his heart in Singapore. The CT scan showed a mass in his lung. PET scan was done followed by a biopsy. It was cancer. The tumour was about 3 cm and it had already spread to the lymph nodes. CT scan report dated 21 March 2012: Presence of a 3.9 cm spiculated soft tissue density mass in the right lower lobe. A 0.9 cm right hilar lymph node is noted. The liver is normal with no focal nodules. PET scan report dated: 18 April 1012: Bronchogenic malignancy, 3.5 x 2.6 cm. FDG avid right infra-hilar adenopathy. The doctor suggested surgery but my father declined. However, he agreed to undergo chemotherapy. This was started in May 2012. He received a total of 12 cycles. Each cycle consisted of 2 injections. Each cycle started with an injection on day 1 and day 7. Rest for 14 days and then started with the next cycle. Chris: Did you know what drugs they used on him? ??? Not sure! (later, the son found out that his father was given: Chemo drugs: Gemzar and Cisplain. Others: Zometa for the bone, Eprex (epoetin A) and Gran – blood boosters). C: Why did you want to do chemo? Don’t you know that chemo is not good? C: Did you fully believe what he told you? Yes. But with time I learned from the internet chemo does not cure! C: Did you ever ask the doctor if chemo is going to cure? Yes, I did ask him. The oncologist said, ” We need to try first. There would be 30 percent chance of cure, the remaining 70 percent cannot be cured! C: Which means that you only have a 30 percent chance of success and he asked you to try? Is that reasonable? After 3 cycles of chemo, the oncologist said my father belonged to the 30 percent success group – can be cured! 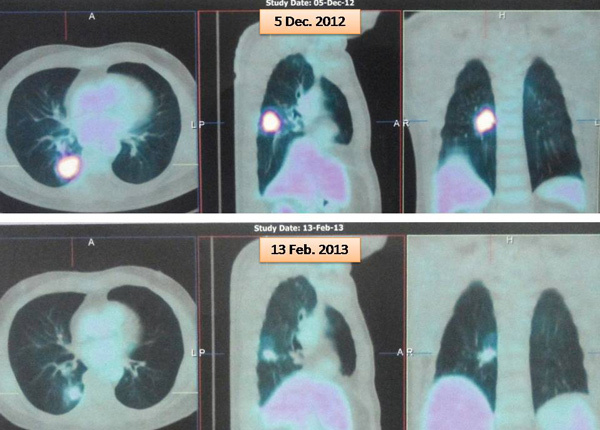 PET scan report on 13 February 2013: Reduction in uptake and size of the mass in the lower lobe of the right lung. Prior size 2.3 x 1.6 cm to 3.8 x 2.6 cm. C: So you continued with the chemo? Yes, until 12 cycles. But there was no cure. C: Did you ask the doctor why earlier on he said you belonged to the 30 percent can-cure group but now he had failed to cure your father? What was his reaction to that? So he asked you to trust him – what does that mean and what could this lead to? By then, did you still trust him? C: Only after 12 cycles of chemo – only then you realised that you could not trust him anymore? And did you continue with more chemo? Study the above and you will note that more chemo does not make any difference now! 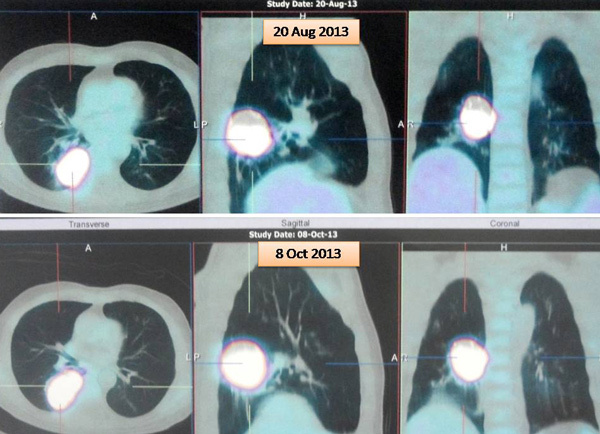 PET scan report on 8 October 2013: The previously noted hypermetabolic right lower lobe pulmonary mass appears to be larger. Current size 6.5x 4.2 cm versus prior size of 5.2 x 3.6 cm. There is interval development of a subcentimeter mildly FDG avid lymph node posterior and inferior to the right main bronchus. From April 2013 (i.e. one year after diagnosis) until October 2013, my father did not receive any treatment. On 9 October 2013, he underwent an operation to remove the tumour in his lung. After the surgery he was not on any medication. On 14 April 2014, my father did a PET scan and there was no recurrence in his lung, but PET scan showed the cancer had spread to his liver and lymph nodes. 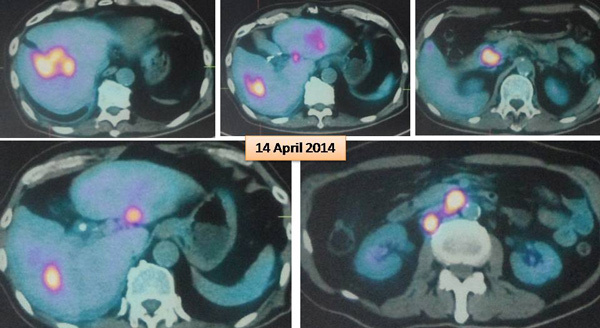 PET scan report 14 April 2014: Multiple FDG avid lesions in the liver – segments 7 and 8 (size of 6.5 x 3.6 cm); segment 2 (3.0 x 2.4 cm) and segment 5/6 (2.5 x 4.3 cm). No suspicious hypermetabolic pulmonay nodules are detected. Multiple FDG avid lymph nodes in the abdomen – peri-portal regions (size of 2.2 x 2.8 cm); retrocaval (1.8cm) and aorto-caval regioin (1.8 cm). The doctor asked my father to undergo chemotherapy again or take oral chemo drug. My father refused to do both. The chemo treatment came to about 1.5 billion rupiah (approximately RM 0.5 million). The surgery cost an additional 0.4 plus billion rupiah. So the total cost of 2 years of treatment in Singapore came to about 2 billion rupiah. Is this story unique? Not at all. It happened most of the time with lung cancer patients. 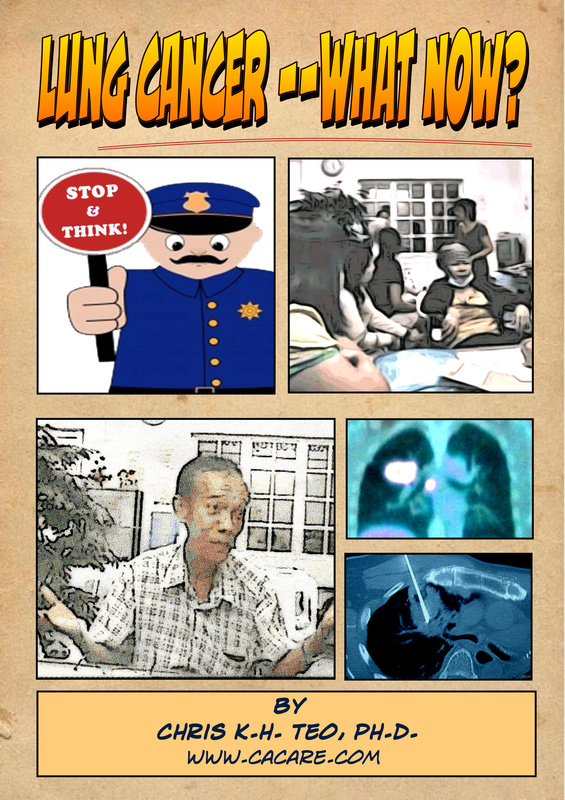 Story 5 in our book, Lung Cancer – What Now? 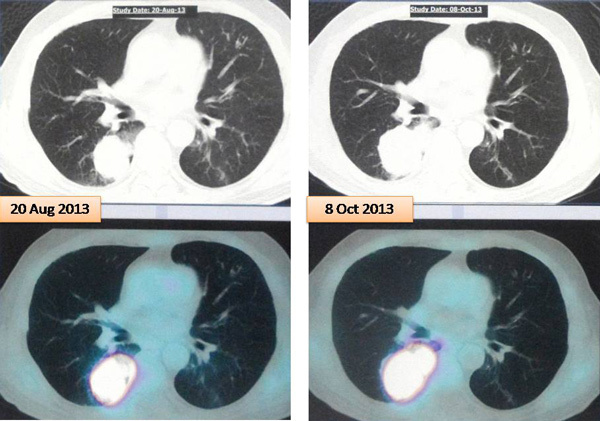 tells of a lung cancer patient who underwent similar treatment by the same doctor! The family spent 8 billion rupiah (approximately SGD 1 million). The result: The same, disastrous ending. He died soon after coming to see us. Over the years dealing with patients, I began to see a very clear pattern emerging in the medical treatment for lung cancer. If you wish to know more, just read the following and learn to become an empowered patient. Perhaps you don’t have to die suffering and at the same time leave a “big hole” in your bank account.